2008 Cardio Tennis Feeding Shootout: Are You Ready? The Cardio Tennis feeding shootout is off and running again for 2008! The shootout provides a great way for Tennis Professionals to demonstrate their feeding skills and have a chance to win prizes. At this year’s 2008 PTR Symposium, we had 24 participants and the winner, Catalin Chira, finished with a score of 47 and was awarded a $400 cash prize. The runner-up was given a 2009 PTR Symposium pass. The USTPA will be hosting Cardio Tennis Feeding shootout events at their divisional conferences with prizes awarded for first and second place. The winners of each event will be provided an opportunity to compete in the Cardio Tennis Feeding shootout finals at the 2008 USPTA World Conference on Tennis. This event will be held September 15-18 2008, at the La Quinta Resort and Club, in La Quinta California. The winner of the finals will receive $500 and the runner-up will receive $200. 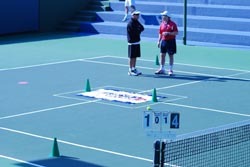 Now is the time to start preparing for the 2008 USPTA Cardio Tennis Feeding shootout by downloading the 2008 court configuration from here on partners.cardiotennis.com. So get out there and start practicing and perhaps you can become this years USPTA National Cardio Tennis Feeding champion! This entry was posted on Thursday, March 6th, 2008 at 3:18 am	and is filed under Cardio Tennis. You can follow any responses to this entry through the RSS 2.0 feed. Both comments and pings are currently closed.